Analysts and investors are optimistic about KB Home, but the numbers don't justify that view. Homebuilding stocks haven't had a great 2018 so far. 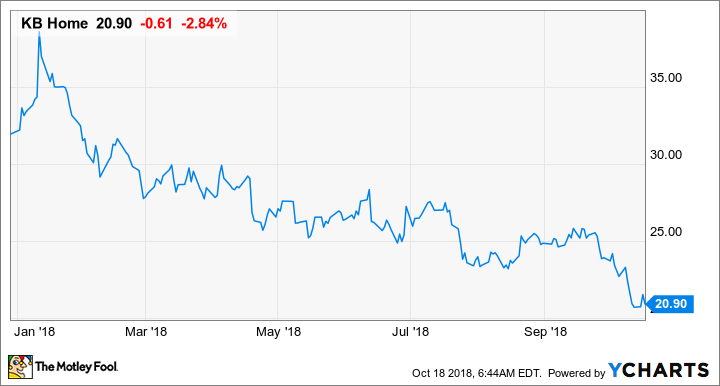 The S&P Homebuilders Select Industry Index is down 21% year to date, and analysts have been downgrading their outlooks for most of the nation's largest homebuilders -- with one notable exception: KB Home (NYSE:KBH). So far in 2018, analysts have upgraded its stock six times, and the consensus estimate it that the company will grow 26% annually over the next five years. Also, at 14 times earnings, KB Home is the most expensive stock among its peer group. Given all that praise, one might expect the company's earnings and operating performance to be head-and-shoulders above the rest. Yet when one compares its recent results to those of its peers, it's hard to find anything in the numbers that justifies assigning KB Home such a market premium. Here's why Wall Street is flat out wrong about this stock, and why investors interested in taking a position in the homebuilding industry should be looking elsewhere. Viewed in a vacuum, KB Home's most recent results look pretty good. Revenue ticked up on higher home delivery numbers, which more than offset a slight decline in the average sales price per home, which was $408,000 for the quarter. The company also improved its net income margin thanks to slightly higher gross margins, reduced selling, general, and administrative expenses, and better results from its financial services arm. Source: KB Home. Chart by author. These statistics would seem to suggest that the company is doing well, especially amid all the news about a declining housing market. The numbers are a little deceiving, though, because home deliveries are typically for orders that were placed months ago, and are thus more a reflection of the housing market three to six months ago than of its current state. The company's net new orders numbers and its cancellation rates are more in line with what we're seeing in today's housing market. The company had 2,685 net new orders, but delivered 2,998 homes in the quarter -- which means that its backlog contracted slightly on a unit basis. Also, the company's cancellation rate on orders ticked up to 26%. Where does KB Home stand out? For all the praise that Wall Street has heaped on KB Home, you would think that the company was doing something better than the rest of its peers to earn its market premium. Looking at what KB Home offers to its clients and what it offers investors, though, it's not entirely clear what analysts see in this stock. KB Home generally targets first-time buyers, which means selling more affordable homes. If we strip out its West Coast results -- heavily influenced by California's high real estate prices -- the average home sale in its portfolio is in the $300,000 range. At the same time, KB Home touts the level of customization it offers to customers on their homes, claiming that it can offer a high-value product for low prices. That sounds like a great proposal, but higher levels of customization translate to higher labor costs per home, and lower margins. The other questionable thing about KB Home's approach is how it develops future lots for homes. Homebuilders keep inventories of future lots on their books in two ways: Owned lots and optioned lots. With owned lots, the company buys the land, does the subdividing, and adds things like roads and utility hookups. On optioned lots, the homebuilder gives a developer an upfront payment do the legwork, in return for which it gets the rights to buy that land in the future at a discounted price if it wants it. Using owned lots can mean higher profits, but using optioned lots ties up less capital. Most other homebuilders are shifting their mixes toward a greater proportion of optioned lots to make their businesses more nimble, but KB Home is doubling down on owned lots -- 75% of its lots are owned. As a result of those strategic decisions, KB Home has lower margins, lower rates of return, and a higher debt-to-capital ratio than its peers. Perhaps analysts are looking at those metrics and concluding that KB Home has the most room for improvement. That's possible, but its current strategy doesn't really lend itself well to boosting those metrics. Also, if it hasn't been able to improve performance during the past few years, when housing prices grew significantly, what makes analysts think it will be able to do so in a flat or declining home-price environment? KB Home is going to face the same headwinds and benefit from the same tailwinds as everyone else in this business, and it's quite clear that it is a real laggard in terms of generating returns for investors. Also, analysts' 26% estimate for KB Home's annualized growth rate for the next five years seems lazy at best. Just because the company grew at 26% over the past five years -- while the real estate market was still recovering from the 2008 housing collapse -- that doesn't mean it will continue to. Housing starts in the U.S. are now back to historical levels, so opportunities for outperformance will be fewer and farther between. The homebuilding industry is a good place to consider investing in right now: Valuations are dirt cheap, and Wall Street appears to be baking a huge (and a bit overblown) market contraction into its calculations. However, investors interested in this space should avoid KB Home.